If your read the previous article you notice the red warning about forcing the quorum. As an advice is never too much, let me write it down again here : “Be careful that the best practice is to shutdown the other nodes to avoid any kind of conflicts if they reappear during the process of forcing quorum“. But if some network problem is happening it might not be possible to shutdown those other nodes. Would it be really bad ? But what could happen if while we do this, or just after, the network problem got resolved ? In fact we will have that split-brain situation we would like to avoid as much as possible. So what happen ? And why ? 'The member has resumed contact with a majority of the members in the group. The node ejected the other nodes of the cluster and of course no decision was communicate to these servers are they were not reachable anyway. member has resumed contact with a majority of the members in the group. 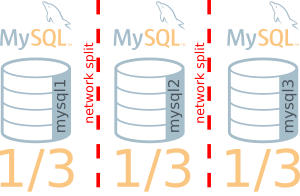 Same on mysql3, this means these two nodes reached majority together and ejected mysql1 from “their” cluster. This is of course the worse situation that could happen when dealing with a cluster. The solution is to prevent the nodes not being part of the the forced quorum partition to agree making their own group as they will have a majority. This means that if there a problem and the node is not able to join the majority after 30 seconds it will go in ERROR state and then shutdown `mysqld`. Pay attention that the 30sec is only an example. The time should allow me to remove that timer on the node I want to use for forcing the quorum (mysql1 in the example) but also be sure that time is elapsed on some nodes I can’t access to be sure they removed themselves from the group (mysql2 in the example). 'Auto-rejoin procedure attempt 1 of 1 finished. [System] [MY-013172] [Server] Received SHUTDOWN from user . Shutting down mysqld (Version: 8.0.16). Forcing close of thread 10  user: 'clusteradmin'. Forcing close of thread 35  user: 'root'. Shutdown complete (mysqld 8.0.16)  MySQL Community Server - GPL. of thread 10  user: 'clusteradmin'. of thread 35  user: 'root'. 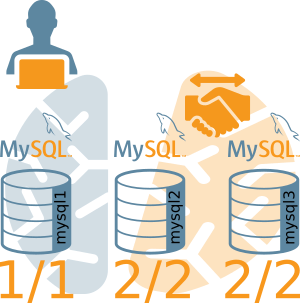 And when the quorum has been forced on mysql1, as soon as the network issue is resolved, none will join the Group and the DBA will have to use the shell to perform cluster.rejoinInstance(instance) or restart mysqld on the instances that shutdown themselves. 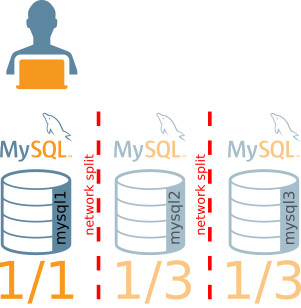 So as you can see, by default MySQL InnoDB Cluster and Group Replication is very protective for split-brain situation. And it can even be enforced to avoid problem when human interaction is needed. If you have 3 nodes, on 2 then ! Of course it might be much simpler to set it on all nodes. Be aware that if you don’t react in the time frame defined by group_replication_unreachable_majority_timeout, all your servers will shutdown and you will have to restart one.